Milan, February 2, 2019. For the sixth season running, Dainese and AGV are the Official Safety Partners of Sky Racing Team VR46. 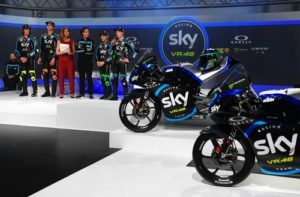 The 2019 MotoGP Championship, which kicks off in Qatar on March 10, will see professional riders Luca Marini, Nicolò Bulega, Dennis Foggia and Celestino Vietti Ramus in the team colours. Dainese and AGV will once again make it their mission to protect the world’s fastest riders from head to toe by continuing to support Sky Racing Team VR46, the incredible Italian team that has enabled young talented riders to shine in the most important international championship for the last six years. 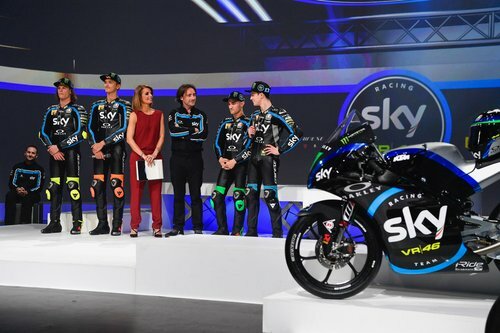 Ambitious goals for the 2019 campaign, with Luca Marini and Nicolò Bulega racing in Moto2, together with Dennis Foggia and Celestino Vietti Ramus committed in Moto3. The professionals riding with Sky Racing Team VR46 will be protected on the track by Dainese D-air® suits, the airbag system made with state of the art technology that made its debut in the MotoGP as early as 2007. Dainese D-air® is packed with special features, including the airbag filled with microfilaments that prevent deformation and ensure controlled inflation, guaranteeing uniform pressure and protection on every single inch of the surface. Continuous and ongoing research has led to designing an airbag that covers the areas of the rider’s body where protection is an absolute necessity, in a way that ensures the perfect balance between ergonomics and safety. The head-to-toe protection system from the Dainese Group includes the FIM homologated AGV Pista GP R helmet, developed under the strict AGV Extreme Safety protocol. This helmet provides the perfect equilibrium of protection, performance and comfort, which translates into the most advanced helmet ever to hit the market.